Joe Bonamassa is back with a new album. 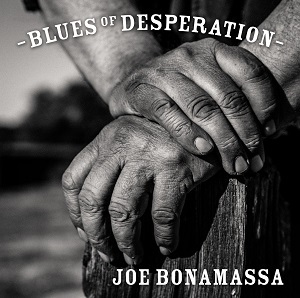 This new album, "Blues of Desperation" is his new studio album and features all-new material. Bonamassa is an artist that has probably done more than any other musician in the last few years to raise the profile of the Blues and to bring it to a new audience, and has a heavy release schedule once you include live albums, covers or side projects and collaborations - indeed he never seems to take time off. Studio albums of new Bonamassa material though are slightly less frequent and are always eagerly awaited by his fans, and he has plenty of those - at a time when most blues artists play fairly small venues, Bonamassa is playing arenas. As usual, the album is produced by his long-time producer, Kevin Shirley. That means you know the production is going to be top quality - it always his with him. Alongside Bonamassa is a talented team of musicians including two drummers. Alongside Anton Fig, who has worked with Bonamassa a lot, Kevin Shirley introduced Greg Morrow as a way to shake things up and push Bonamassa to work even harder. Other musicians include Michael Rhodes (Bass), Reese Wynans (Keyboards), Lee Thornburg, Paulie Cerra and Mark Douthit (horns) and backing singers Mahalia Barnes, Jade McRae and Juanita Tippins. The album kicks off with the excellent "This train". It's got a fast, driving pace which is what you tend to expect with a title like that, and it's a great way to kick off the album. "The valley runs low" is a lovely soulful track and quite different to most of his material. It's a superb song and Bonamassa's vocals really sound great, as does his guitar playing. While I did enjoy "Different shades of blue", this new album just blows it away - this latest album is in my view one of the best albums Bonamassa has released to date. He's really pushed his boundaries on this one and the result is a stunningly good album with not a single weak track, an album that all blues fans really need to listen to.